When Roku quietly acquired a Denmark-based multi-room audio startup called Dynastrom in late 2017, it didn’t announce what, exactly, Roku - a patently TV-focused company - needed a bunch of audio engineers for. 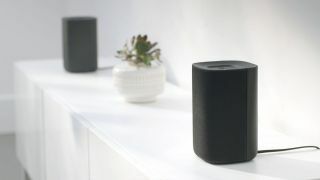 Today, those plans have become abundantly clear: Roku has designed a pair of wireless TV speakers that will leverage Dynastrom tech to connect seamlessly to any Roku TV. Roku will start shipping the speakers in October of this year here in the US for $199.99 (about £150, AU$270), available exclusively through its website and, to sweeten the deal, the speakers will be available to pre-order this week for $149.99 before increasing to just $179.99 for the remainder of the pre-release window. The big draw here is the fact that the speakers don’t require any cable running to the TV itself - merely requiring a power cable - and can connect to your router via Wi-Fi. The speakers will then pair with any Roku TV via an on-screen setup process but, in case you want to stream music directly from your phone, don’t worry: Roku says the speakers will support Bluetooth as well. Roku TV Wireless Speakers with the Roku Touch and Roku Voice Remote - all part of the launch bundle. At launch the speakers will come bundled with the high-end voice remote from previous Roku TV models and the Roku Ultra, as well as another completely new product called the Roku Touch - a battery-powered remote with programmable presets, a suite of playback controls and a built-in microphone. According to Roku, the programmable presets can be set to any voice command (like “Play jazz music on Amazon Music”) and is intended to be used in rooms adjacent to the living room where you might’ve lost remotes in past. While the Roku TV Wireless Speakers and new Roku Touch seem to serve relatively niche audiences at the moment, Roku believes that there’s a large group out there who will enjoy the simplicity of the system over the complexity of AV receivers and 5.1 surround systems. Originally Roku announced at CES 2018 that it planned on releasing a smart soundbar in the later half of the year with TCL but couldn't comment on when that product would be coming in relation to the Roku TV Wireless Speakers. It's Amazon Prime Day! Click the link to see all the best deals!